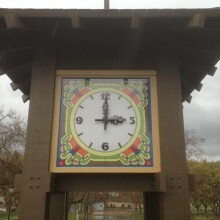 Almost thirty years ago, the Alameda county fairgrounds in Pleasanton, California had their four clocks removed for repair. For unknown reasons, those clocks were never returned to the fairgrounds clock tower. From here, Americlock entered the picture. 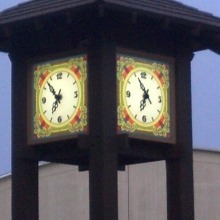 The director of grounds contacted Americlock to see if they could provide the fairgrounds with some clocks to replace the original ones that never made it back. After talking with the client and discussing the original clocks and their design, we concluded that they used to have multicolor stained glass clocks. Due to budget restrictions, building new stained glass clocks wasn’t an option. Fortunately, Americlock had the capability of producing exact replicas using all of the colors that were found on the original clocks. The client was also able to find the initial blueprints of the clocks that still had all of the designs and colors marked on them. Armed with this information, we were able to design the new replica clocks to have all of the character and charm from the original stained glass ones. Americlock provided installation on site for this client because the client wanted to make sure that the new clocks would be installed correctly and by professionals. Using a scissor lift provided by the client, Americlock was able to complete the installation of the four clocks in one day. Since the county fairgrounds are used both day and night for events, Americlock placed energy efficient LED light boards behind these clocks to evenly illuminate them at night. The new LED lights boast a lifespan of 100,000 hours with no maintenance or changing of bulbs required. Inside the tower, the clock controller was placed in a fan cooled fiberglass enclosure to keep the clock controls at an ambient temperature. All four of these clocks are set from this controller which will adjust for daylight savings and power outages automatically. 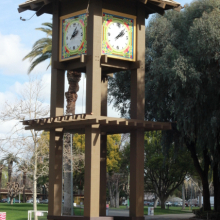 After almost thirty years, the Alameda county fairgrounds finally has the centerpiece back in their clock tower and they couldn’t be more pleased.